Analytix provides after sales servicing for all instruments supplied, this is completed at user site. “Back to Bench” service is also offered for any equipment needing this attention. Preventative Maintenance packages are available and are designed to meet user requirements with as little disruption and down time as possible with pre-planned maintenance visits. Preferential response time for contract customers is given along with reduced travel and labour rates. Extended warranty packages for one or multiple years. Only genuine manufacturer replacement parts are used during service and PM visits. All support staff carry IOSH Safety Passport – HSE compliant. No sub-contracting to other service providers. The compliance with regulations and data traceability are important values in the modern analytical laboratories of pharmaceutical, food and other regulated industries. The qualification of the instruments and of their related methods into these industries often goes through multiple steps in order to ensure that your instrument meets these regulations. Milestone provides comprehensive Milestone Validation Package (MVP) that meet these needs. Milestone Validation Packages is available for UltraWAVE and EthosUP. 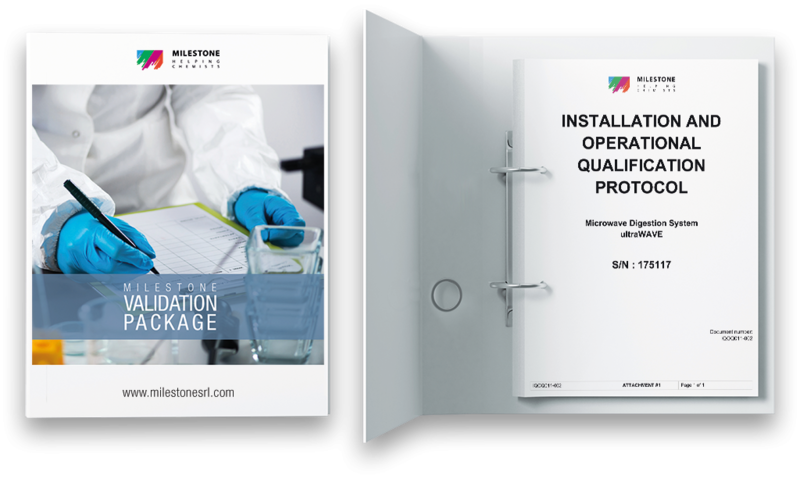 The Milestone Validation Packages include several protocols in order to fulfil regulatory requirements, such as the Good Manufacturing Practice (GMP) guidelines that, along with our superior support and expertise, will be by your side throughout the whole process. Our experts will support you with the right configuration, with a dedicated procedure for your samples, with a demonstration of the system’s capabilities and with a complete validation package that includes: DQ (Design Qualification), IQ (Installation Qualification), OQ (Operational Qualification), PQ (Performance Qualification) and the requalification. All the tests carried out by our service engineers are guaranteed by certified test equipment, providing high accuracy and meeting all the regulatory requirements. Our software is fully compliant with the FDA regulation 21 CFR part 11, with an exhaustive audit trail for complete traceability. The MVP is one of the multiple services offered by Milestone to ensure the highest industry standards in customer support.